I noticed that there are increasing numbers of people getting sick these days not only in my work place but in the compound as well. 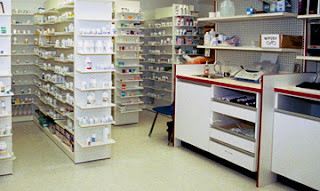 I can say that people are frequenting drug stores for their medicines and vitamins. We all need vitamin supplements to build immunity against prevailing sickness caused by drastic changing of weather. When I dropped by the newly built hypermarket I was impressed by the orderly and functional Pharmacy Design in one of the leading drug stores in the country. You can see that medicines are properly stacked and well labelled for easy access. I love the setup because even when there are plenty of customers they can cope up because they’re able to locate the needed drugs and medicine essentials.